in Oil we have reached more than your target. Could you please update this chart? Okay. Assume the trend remains the same, until a channel about this move is breached by upwards movement. It appears that Subminuette wave ii is complete and Subminuette wave iii has begun. At 15:00 EST, it back tested the breakout channel. Judging from Lara’s post yesterday, I was expecting this move up to be much stronger though. Yes I was also expecting much stronger wave and higher peak. Glad we did get some rally as miners were down a lot at market open before rally and then miners ended day lower than the close yesterday and as low as open today, and I sold all my miners. I am awaiting Lara’s report and if get it before after market closes at 7:00 pm and expecting strong rally Friday than will buy my miners back tonight while they are still down. Good news for the U.S. Dollar I should have said. Good news came out just as it started up. Then it did a turn. Good retail sales, now talk of earlier rate increase. I am not to sure about this wave (ii) completion???? Of it is in impulse wave like Lara wrote it should have momentum to rise. There is no way a correction wave would have bottomed at 1216 them did 4 peak mini rallies today. Next I believe this has already started. Then the following sideways movement for minuette wave (iv) should show up on the daily chart as a sideways consolidation phase lasting at least two days maybe later, and it may be very deep. It should find support at about the 1,218 to 1,215 zone. I sold everything in rallies today and looking to buy cheaper in minuette wave (iv) correction and hold for next higher target. Submiuette wave 3 cannot be over as has not exceeded high of subminuette wave 1 at 1239. We do not know wave (ii) is complete or know. Lara said this wave will be shallow. Again it appeared on a daily chart as Doji..
Why guess this evening will get the report. There is a gold mini rally right now 2:30 pm, dont know about tomorrow. Is expectation of this impulse wave to be over is today or tomorrow? I hope gold does not get stuck another day of side way movement like last two days. Gold need to go thru these aqua and red line on spot gold chart from Kitco. papudi you seem to know Elliott Wave. Have we done a 5 wave count today since 10:00 am bottom? When I look at some charts it looks like it did and wave 5 peak was at 12:12 pm? Is that correct or are we in a correction and still about to finish this rally today. I am not talking about 1262 or 1281 just this rally for today? I want to exit at a high today and not be stuck in minuette (iv) down a few days? Clearly it looks like good selling times were at 1229 at 11:35 am or else at 1232 at 12:16 pm. Is there another wave up today or have all 5 wave counts finished for just today’s rally. Anyone please? 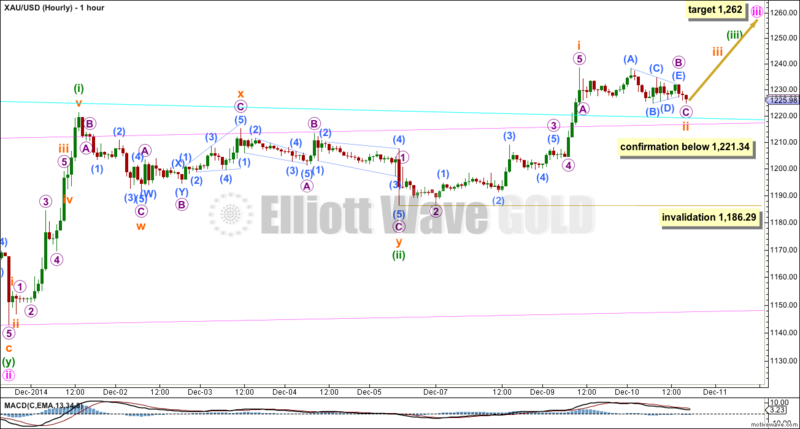 From chart it appears gold just finish wave1 up and is just completed wave 2 correction at 1226 retested breakout. It now appears to be in a wave 3 that should take it to 1240. Gold double bottomed at 1216 at 10:05 am and was already up $11 by 10:31. I think that signaled the end of minuette wave (iii). Followed by “3rd of a 3rd of a 3rd wave firing up it’s thursters for today’s rally. Or else a bunch of gold and miners bottom feeders jumped in as soon as they didn’t have to catch a falling knife to buy gold. I did buy more GDX at 9:38 at a discount while there was blood in the streets and people were dumping their gold and running for their lives. 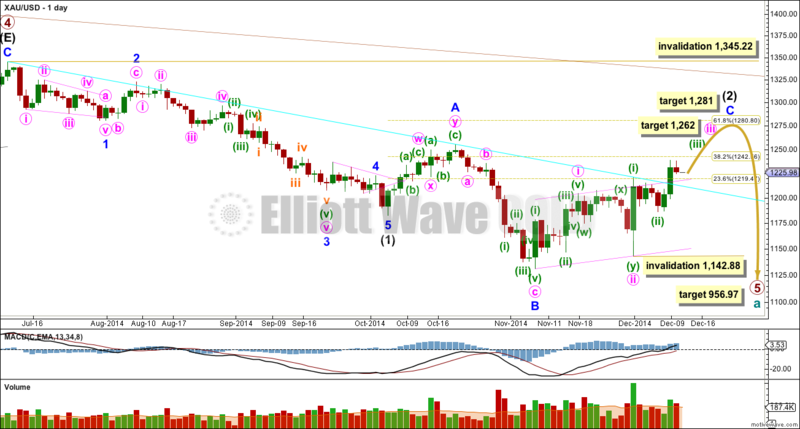 All thanks to Lara providing the inside scoop on gold’s Elliott Wave projections and the support systems in place for gold’s rally this week. Of course I will sell all at the next top this week hopefully today and I’ll safely from the sidelines watch minuette wave (iv) bottom and be ready to buy again at a great price, where cash is king. Prosperous trading. Correction to my comment above. I think that 1216 at 10:05 am signaled the end of the second wave correction within minuette wave (iii), and the start a new wave way up which I believe just started at 10:05 am. What was the key to know that wave (ii) ended at that moment? I need to learn to identify these points. 9:00 am EST Gold hit support zone 1218 – 1215 pink and aqua blue lines on hourly chart Lara said it would be strong zone in video and repeated that daily this week not the exact number but those trend lines and then a double bottom a good sign not 100% and patience. Well executed trade and great plan. Looking to go cash once this is over at 1260. Yes Lara’s insight has helped me as well. Otherwise I was clueless. There are three price points need to be breached as I see it. Of course holding support here 1218-1215. Next gold need to trade above 1220. Then cross 1226 low of yesterday. Then cross 1230 the apex of triangle. Then wave (iii) 3rd of 3rd of 3rd will power ahead. 9:00 am EST Gold hit support zone 1218 – 1215 pink and aqua blue lines on hourly chart and we should be going up from here. Building our way back up to next high minuette wave (iii) then minuette wave (iv) multi-day consolidation then up to 1,262 then correct. Even the longer bigger correction coming up minuette wave (iv) should find support here. Still invalidation is 1,186.29 so this wave count is valid above that. if subminuette iii will be equal to sub i ( 52,00 usd ) and considering that after this there will be sub iv, sub v, minuette (iv), minuette (v)……the target for minute wave iii at 1262 do not you seem too low ? Any idea where the wave (ii) will end based on Fib relationship? Gold testing the aqua line breakout and is above the price point. Now gold to move above the apex of the triangle at 1230. Does that still apply and is 1,245 in the ballpark? What happens next to wave count? The wave orange (ii) will be labeled to new low? At what price point gold declares wave (ii) is complete? 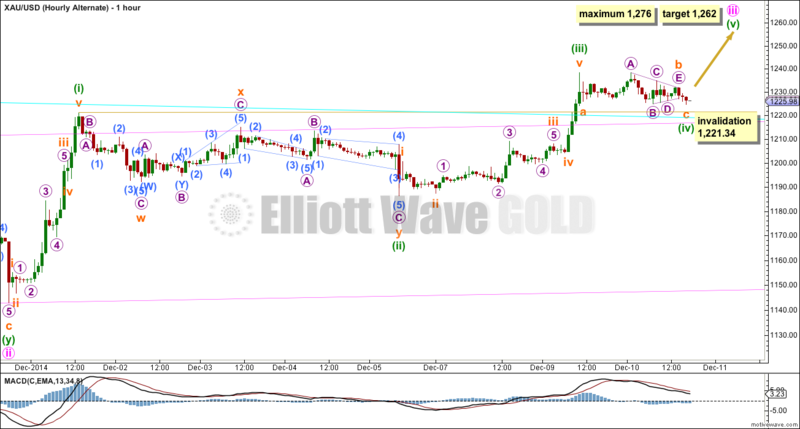 Now gold should pull up fast and furious to upside if the third of third of the third wave is starting. I hope gold does not sink to test 1186???? Hi Lara, on my platform I do not have a red daily candlestick, but green ( the daily open is 1229,06 and daily close is 1229,48 ). Check stockcharts they show a red candlestick. Lara, I prefer the alternate because minuette i was so powerful (almost $80 in price). It is not surprising to see minuette iii shorter than i and subsequently minuette v. This fits the $1262 target nicely. Hi Lara- In reply to Richard you wrote: We’re stuck in a fourth wave now. But it has to be shallow. The invalidation point is REALLY close by at 1,221.34. And invalidation has to be 1186.29. The hourly chart above notes confirmation below 1221.34. Is this for alternate wave count? I get it. My first reply to Richard (which is exactly as you have quoted) was too quick. I spent more time on the hourly chart and swapped my hourly wave counts over; originally I was going to have the alternate as the main and vice versa. You are the Calm in the Storm. I feel better after reading your updates and watching your video, They are an important highlight of my day. Thanks for your help and your professionalism.